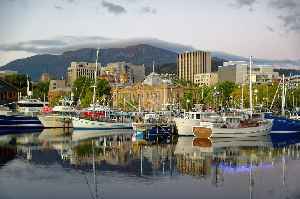 Hobart is the capital and most populous city of the Australian island state of Tasmania. With a population of approximately 225,000, it is the least populated Australian state capital city, and second smallest if territories are taken into account. Founded in 1804 as a British penal colony, Hobart, formerly known as Hobart Town or Hobarton, is Australia's second oldest capital city after Sydney, New South Wales. Prior to British settlement, the Hobart area had been occupied for possibly as long as 35,000 years, by the semi-nomadic Mouheneener tribe, a sub-group of the Nuennone, or South-East tribe. The descendants of these Aboriginal Tasmanians often refer to themselves as 'Palawa'. The body of a man has been found on the side of the road in Hobart.